This adapter worked flawlessly for me to connect my desktop display port to my HDMI monitor. I have tested this DisplayPort to HDMI dongle on a few computers with different resolutions and it has been working well for weeks. The adaptor comes in a small zip lock bag. It is slightly longer than my hand from wrist to finger tip. It is made of very nice materials with smooth modern glossy black ends and a strong yet flexible cable. 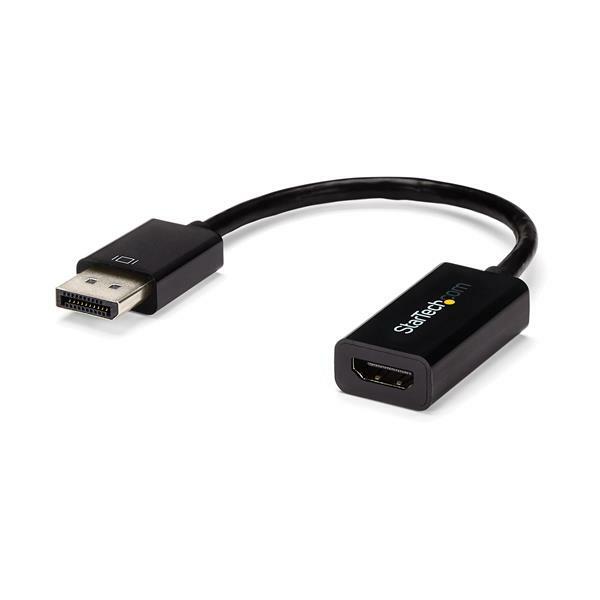 The adaptor plugs into the DisplayPort jack on the computer or docking station then allows an HDMI cable to be connected to it. Both sound and video were converted without any issues. I tested multiple resolutions including above 1080p and all worked well. Once connected video and audio came just as quickly as if I didn't have an adaptor connected at all. This adaptor was easy to use, just plugged it in and it started working. I received this product in exchange for an unbiased review. Didn't work at all. Tried two different screens and laptops and different DP ports without success. Other DP cables working fine though. Thanks for sharing your experience with us. We hope we can help. While it’s possible your adapter is faulty, We also wanted to check what resolution and refresh rate you are using with the adapter? This adapter only supports up to 4K at 30Hz. If your tested displays are using 4K @ 60Hz, that may explain why it wasn’t working. We also sent an email to you at the address left with your review. The product worked well for me. I had no issues using it at all. It was simple and easy to use. I would recommend this product. I received a free sample of this displayport adaptor and it`s been working great - displaying high quality video resolutions and audio. It`s compact and hassle-free, ready for plug-and-play like the website claims. All sound and picture are very crisp and I`m fully satisfied. This review is for a Displayport (Male) to HDMI(Female) cable adapter. It arrives packaged in a clear Zip-loc bag with branding , some graphics and text. The graphics clearly show the type of ports the cable has for a consumer to understand exactly what he is buying. There is also a QR code provided which can be scanned to see the tech specs. Inside the zip-loc bag is cable in all its glossy grandeur with both the dongles wrapped in plastic to keep the shine intact and also the male adapter has a removable plastic casing protecting the port`s gold plated contacts. Full marks on the packaging. The cable itself is a short one(approx 5` barring the adapters) and is convenient from my viewpoint since all but one of my devices have an HDMI output port. Hence this being a short cable can be stored with that single laptop all the time without worrying about its storage space. Both the dongles are of heavy duty plastic and look great in the glossy finish. Using these is extremely straight forward and only takes plugging into the Displayport of the laptop. From then on its the regular practise of plugging the HDMI cable from the monitor into the input(in this case, the female HDMI port on the cable). This is better than the direct dongles(without the wire in between) with the ports on either sides of a single plastic body. The reason is that due to size of the dongles, there is a lot of pressure on the laptop`s ports and there are chances of damaging the ports. With this, the wire is flexible and hence does not put much pressure on the laptop`s ports. The biggest advantage of this is that I do not have to buy a separate monitor or use a separate cable to be inserted into the back of the monitor.This is exactly(and more) what I was looking for. I was provided a free sample for review and feedback purposes. The review is based on my initial impressions and usage of the product for weeks and the rating is based on its ease of use, convenience, precise fit and the overall build quality weighed against its list price of around $37. Given that this saves a lot more dollars of a monitor`s cost and provides convenience with good build quality which outweighs its price, however it is available for lower prices on other sites. Hence I suggest a GREAT buy rating for the product but a GOOD rating based on the price on this site. I bought this on the 19th September as it allowed me to use the correct screen resolution for my wide screen, however since using it my screen keeps blacking out randomly; i now have to use my laptop with direct hdmi to hdmi. This adapter needs to be better quality to work as it should. 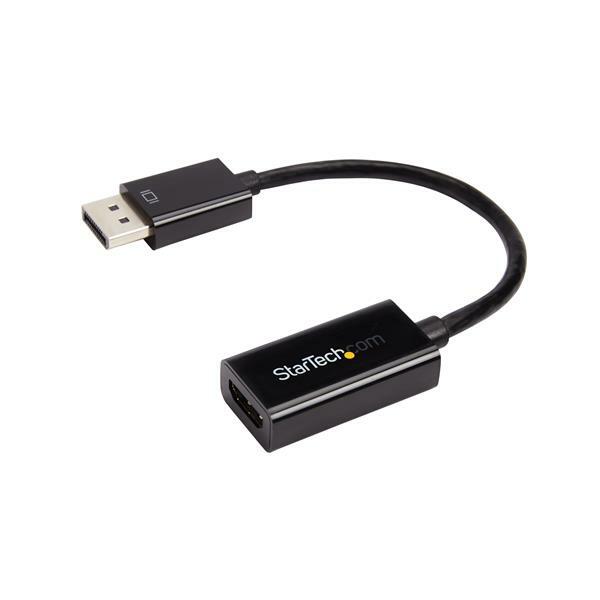 We purchased a couple of these adapters for our workstations that only have a Display Port output. It transfers video with no problem but for being a HDMI, it should transfer sound as well. We had to do a lot of troubleshooting in the beginning to get the sound working and after countless of hours it finally got it going. Then a month went by and the sound suddenly stopped. Stay away from this product. Save your time by purchasing a workstation with an actual HDMI output. (5 stars) Works as advertised. Good quality adapter that performs exactly as advertised. Really like the flexible adapter, useful in tight spaces.